As you know Video Chat is most amazing way of connecting two different people’s world on handset, computer, Tablet and other Gadgets. Technically Video Chat is way of communicating simultaneously with two-way of Video and audio transferring. Even group of people can also join on both side and they can Chat. As this technology is getting advanced, it was working on 2G before now trend is moved to 3G. That is process of data transfer is increased. profession, and many other similarities. If you like some stranger you had talk you can reveal your real name and email ID so that in future persons can connect you on Facebook easily. This is one of best feature in this Airtime. Even you can share your Video from YouTube too. This is amazing site for Video Chat. As you know that Skype is one of most popular Video Chatting service which has more number of users in the world. This service was found to compete with landline and other mobile user with Video Chat. This service connects with Facebook account and lets you to chat with high quality. One best thing about this service is that once you install it, you just need an internet connection. You can chat anywhere over Skype without any mobile number. It is cheaper than other service Video Chat. Let’s see some best thing about Google+ when you’re using Video Chat features. One of thing is no need to download any kind of separate software for Video Chat. Just you have to login to Google+ account, select Video Chat and get connected with online friends and family from any part of world. Here you have compatibility of sharing Video from YouTube, you can do group Chat with the help of Hangouts, even screen sharing. Facebook is most popular website in staying in touch with your loved ones, friends and family. Every day Facebook is trying new application, as you know that Facebook has also came up Video Chatting recently. But features in this application are not well developed to that extent when we compare to other Video application. Their no compatibility of sharing Video from you tube, group Chat is not there, even screen sharing also not possible. Omegle is Video Chat window which allows all strangers to chat online. One thing parents must be careful about using this software for their children. They must take care of children from using this service since this allows stranger to connect easily. This is totally not safe for fewer than 18 age people since stranger can use language which is uncensored and sexual come-ups and request for email address are also seen. Mostly this Chat window is used for negative approach only so people must take precautionary measures. Recently Chatroulette has come into market in 2010. Can you believe it was created by a 17 year old guy? It has twice the visitors when compared to the Omegle and hence making it better than the others. But it doesn’t have any potential to detect X-rated content. Best thing about this Chat window is even children can also chat, malicious content gets hidden if there is any problem. So it is safer to chat with anyone on window. While using this TinyChat you have to do some formality like you have to create your own account before you login. Then you have to fill all those details in content their after your account will be created you can start using TinyChat with full rights. Flexibility of using this service is very less since there are many constraints like adults can only Chat, Video sharing is not possible. Best thing about this service is that there is no need to download this TinyChat since it gets attach with your browser and you can Chat from it. Like few other services for Oovoo also you need to download and install in system. Then you get start with your own account and chat window. This is latest in Video Chatting services with lot of expectation to grow into this competing market like Skype, Google+, Facebook and many others. Best feature about this Video Chat is, it has high quality Video and Audio transferring process. 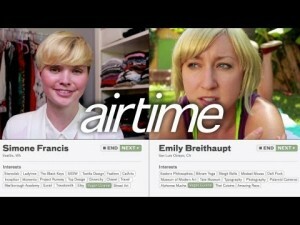 So folks these were the Top 7 Best Alternatives to Airtime. Hope you have enjoyed them so don’t forget to pop your comments in the comment section.